Share your ideas and solutions! Wayblaze, Canada’s first community crowdsourcing and crowdfunding site, has partnered with the Recycling Council of BC to provide this online space where conference delegates can share and vote for ideas, projects and businesses that help minimize waste through greater reuse and sharing of goods and equipment. We invite you to participate in this important conversation about how a deeper focus on reuse and sharing can accelerate our shift to a zero waste province. Simply click on the link below and add one or more great reuse or sharing ideas that you’d like to see happen in your community. Then take a moment to comment, like and share the ideas posted by others. Click on the link below to check out the reuse or sharing initiatives that have successfully reduced waste in other communities around the world. You can add your own inspirations and comment, like and share the inspirations posted by others. Make sure your idea is associated with you! Sign up with your name, email and a password and you’ll be ready to go. Add your idea where it says “My idea is to…” or right-click on the map and do the same. Once added you can edit your idea further. Using the sharing tools provided, make your friends and neighbours aware and get their support for your idea. 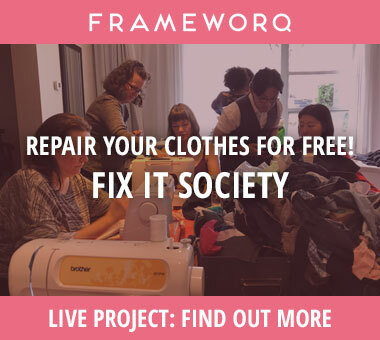 Frameworq’s Community FREE clothing Fix-it events in Vancouver need YOUR support! With you help we can cover the initial costs for supplies, maintenance and all other expenses related to the Fix its, for a WHOLE YEAR! That’s 12 Community FREE Fix-it events that can continue running every month at the Mount Pleasant Public Library! Our first goal is $5,000. We have plenty of great rewards on offer! If our first goal is reached, we will set up an additional goal and hopefully raise enough funding to enable another Fix-it location in your neighbourhood. 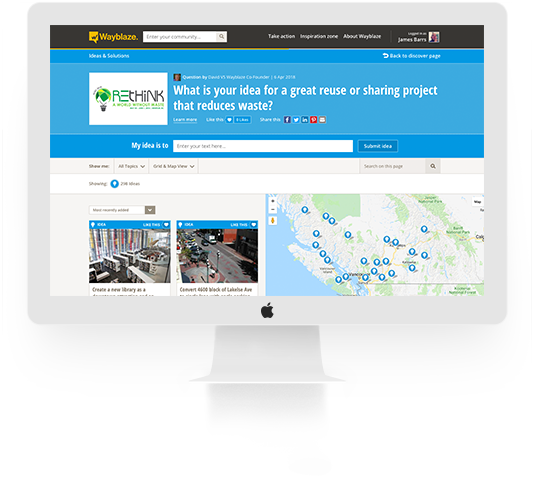 If you want to raise funds for a Waste Reduction project, either now or in the future, then join us for an exclusive webinar: Crowdfunding for Waste Reduction Projects, on Wednesday June 13th, 2018 from 2:00pm – 3:00pm PST. In the webinar you will learn how crowdfunding can help you raise those much-needed funds and build a community of loyal supporters and backers for your organization.